It’s time for all of us to turn over a new leaf and burn less carbon in 2019. This graph shows why it’s so important that we start cutting immediately. If we had started reducing emissions around 2000 we would have had until AFTER 2100 to get to net-zero. If we keep delaying action for another ten years it will be necessary to cut emissions almost to zero in a single year — which is completely impossible. We will need government policies and regulations to guide the way, but the fast change comes when we cut our own carbon footprints. The simplest thing you can do to reduce your emissions is to switch your laundry machine from hot to cold water. But the most IMPORTANT changes you can make as an individual are 1) FLYING LESS, 2) DRIVING LESS and 3) EATING LESS MEAT (especially beef). One great way to show your commitment is to join the #nofly2019 movement. The movement is big in Sweden, but it just got started in North America. If you can commit to not flying in 2019, sign this online petition (https://www.ipetitions.com/petition/nofly2019). 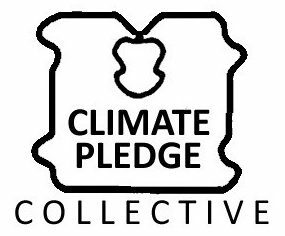 The Climate Pledge Collective system also gives you lots of specific, manageable suggestions (like learning one vegan recipe or test driving an electric vehicle) — print out a pledge sheet or pledge online. But there’s only so much we can do to reduce our own footprints, after that, it’s time to get political. Look up 350.org (they’ve been fighting for so long their stated goal was to keep us under 350ppm), the Climate Mobilization, unistoten camp, or Fridays for Future.